How can you enjoy a sport if you believe nothing is ever right or wrong? There is an interesting quagmire that encompasses a lot of discussions in NASCAR lately and it showed up again this week when NASCAR levied some harsh penalties on the team of Clint Bowyer, who won last weekend’s Sprint Cup race at New Hampshire. NASCAR really seems to raise the ire of fans whenever it makes a ruling on one of many issues covering some of the “gray areas” of the sport. The issues range from ruling whether someone was in the “act of passing,” or whether an on-track incident was “intentional” or not. That doesn’t sound like a bad idea, actually. 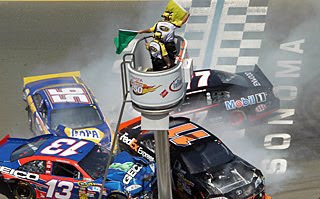 But then fast forward to when NASCAR does issue black-and-white rulings, like how Bowyer’s New Hampshire car failed a post-race inspection under scrutiny at the research and development center. In this case, the car was outside, not only the initial measurements, but also the tolerance area NASCAR grants as well. You would think a clear cut case here, right? Nope. In either case, NASCAR can’t win. There will always be judgment calls in sports – it’s what produces some of the best fan arguments in sports. But when you also start questioning the legitimacy of black-and-white calls, or instead produce excuses for each and every one, you begin to proffer the theory that no one is ever right or wrong. It’s hard to see how anyone could enjoy a sport where none of the outcomes are ever accepted.